When the hustle and bustle of everyday life has you running in circles, we've got the perfect way for you to slow down and collect at any time. 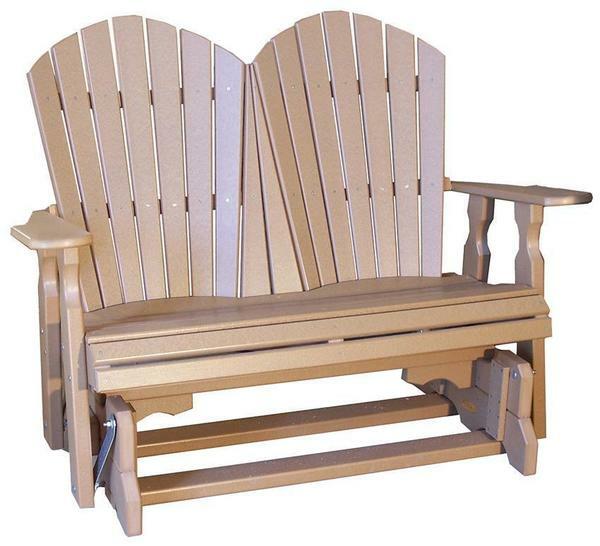 With a deep, cozy Adirondack shape, coupled with thick armrests and a gliding motion that could rock a baby to sleep, our Poly Classic Glider is sure to be your favorite retreat. Crafted by hand from an environmentally sustainable material, you can reconnect with Mother Nature knowing you did a part in helping to preserve the planet. Her gentle pat on the back comes in the form of casual afternoons overlooking your favorite scenery, providing mental and physical rejuvenation in the process. Unlike the run-of-the-mill plastic chairs, traditional wooden furniture, or metal pieces, your new poly furniture is maintenance-free in terms of battling with sanding and sealing, repainting over rust spots, removing splinters, filling cracks or chips, exterminating termites or other insects, etc. The common downfalls of traditional outdoor furniture options will not plague your new poly furniture - leaving you with more time to enjoy your space. Customize the color of your 4' Poly Glider and incorporate it into any outdoor decor. Add a cupholder or end table to ensure a place for your favorite beverage and improve your outdoor living experience.